Indoranyon is a Dunmer stronghold on Azura's Coast. It is one of the ancient strongholds of a brighter time for the Dunmer. The stronghold is on the eastern-most part of the Grazelands, (technically in the Azura's Coast region) south of the port of Vos. It is a relatively typical stronghold from the outside. The strongholds seem interesting to the traveler, but should be approached very carefully. They have largely been abandoned, but have since generally proved attractive to whatever group feels strong enough to hold them. 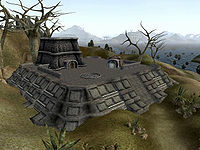 At last report, Indoranyon has been taken over by a group of mages, enchanters, and Daedra worshippers, who have magically altered the interior. One of the enchanters, Qorwynn, is actually the greatest in all of Vvardenfell. He may be able to communicate his secrets to anyone willing to pay for them—unfortunately, he is so paranoid that he is likely to attack on sight, not giving anyone the chance to talk. In order to take advantage of his training, one must sneak up on him with a high Sneak, Invisibility or Chameleon score, or preferably all three to speak with him before he goes into combat. In addition to being the master Enchant trainer, Qorwynn also offers major training in Destruction, and Alteration. There is a Daedroth and a single worshiper guarding the entrance to the stronghold. There is even a note on the door that warns about the magically altered interior. Inside, there are four worshipers and four Daedra. There is very little loot, consisting of two chests. The only valuables can be found on Qorwynn and his apprentice Erundil who holds the Ring of Sanguine Unseen Wisdom. Indoranyon has a Propylon Chamber linking to Falensarano and Rotheran. 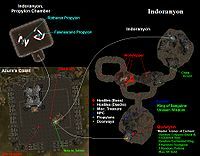 Indoranyon is the only one of the Dunmer strongholds which does not have its own named exterior cell. The exterior of the fort is just named "Azura's Coast" like the surrounding area. Indoranyon can be a deathtrap, as the door teleports you directly to the other end of the interior instead of the door inside. If you want to retreat you should be capable of Almsivi Intervention, Divine Intervention or Recall. The Indoranyon Propylon Index may be found in Tel Fyr, near Divayth Fyr. This page was last modified on 14 January 2019, at 03:12.